Home > Marine 31 Spray Polishing Pad Conditioner 128 oz. Marine 31 Spray Polishing Pad Conditioner 128 oz. Marine 31 Spray Polishing Pad Conditioner creates a smoother buffing experience by providing additional lubrication for your compound or polish. Marine 31 Spray Polishing Pad Conditioner is comprised of a unique blend of wetting agents that prevent compounds and polishes from caking up on the pad or from drying out while buffing. Marine 31 Spray Polishing Pad Conditioner is beneficial on foam, wool and microfiber pads. Application is as simple as spraying directly onto your buffing pad before adding compound or polish! We can all agree that compounding and polishing a boat isn’t as enjoyable as say, hand-applying your favorite carnauba wax to your 1967 Corvette Stingray. That is why we’ve developed a product that creates a smoother buffing experience by providing additional lubrication for your compound or polish. 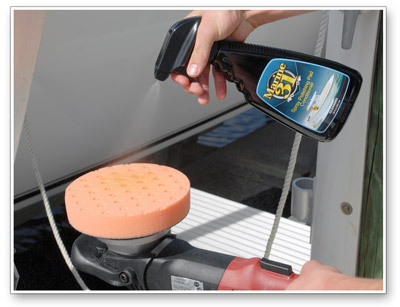 That product is Marine 31 Spray Polishing Pad Cleaner and it makes polishing your boat easier than ever! By creating more lubrication for your compound or polish, the chance of it caking up or dusting during the buffing process is significantly reduced. The additional lubrication provided by Marine 31 Spray Polishing Pad Conditioner also reduces buffer hop, therefore improving consistency while decreasing user fatigue. Marine 31 Spray Polishing Pad Conditioner is arguably one of the most must-have products for compounding or polishing a boat. Use it once and you’ll wonder how you went without it! Marine 31 Spray Polishing Pad Conditioner maximizes the operating life of your foam, wool and microfiber pads with the additional lubrication it provides. Its advanced blend of wetting-agents and conditioners decreases friction which in turn reduces wear-and-tear on pads. Marine 31 Spray Polishing Pad Conditioner also works great for removing stubborn compound and polish residue from gel coat finishes. 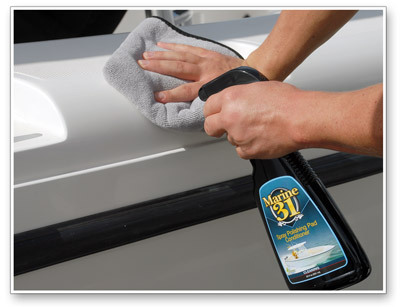 If your compound or polish isn’t wiping off as easy as you think it should, mist a couple sprays of Marine 31 Spray Polishing Pad Conditioner as you wipe and your compound or polish will be noticeably easier to remove. Marine 31 Spray Polishing Pad Conditioner is harbor-safe and eco-friendly. Spray one or two light mists directly onto pad before applying compound or polish. When working on heavily oxidized gel coat finishes, add two to three sprays each time you apply more compound or polish to the pad. To aid in the removal of stubborn compound or polish residue from gel coat finishes, simply spray directly onto the surface as you wipe.